This is Lynn’s jump height. It’s about a tile plus some change. 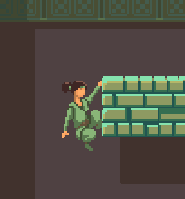 Not enough to jump over two tiles. she should be able to clamber over. to perform a ledge hop. Doing it just right can be a little bit faster. unless the game is saturated with 2+ tile ledges. … But now it can be performed mid-air! forward against a target cliff. Easy peasy. right past their target platform. At least for now, clambering feels like a fun addition. Can I really call it a trap when it's so obvious? I guess, technically, it's a hazard. non-interactive unless it was descending. but with a giant guillotine it looks funky. The guillotine now functions as a falling, killer wall. but it's good for now. 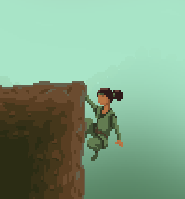 Ah I missed the cliff clambering update. Very cool. I don't know how free your control inputs are right now, but you could do an assassins creed and have it so you only clamber when a certain button is held (i.e. a trigger or some such). clamber when a certain button is held (i.e. a trigger or some such). I agree! In fact, that’s exactly what I started with. Or at least that's what it used to be. Playtesters couldn’t get the hang of it. and focus on automatic input. the jump button, or holding forward. Players now grab ledges on accident. I also made grapple points automatic. just snap right onto them. And playtesters pick it up immediately. I’m a total convert to automated controls. I’ve joined the cult. My card is in the mail. Right trigger? What right trigger? Like the guillotine, not hidden. I've got them scooting back and forth. to turn them into satisfying obstacles. This post is now all about ferris wheels. 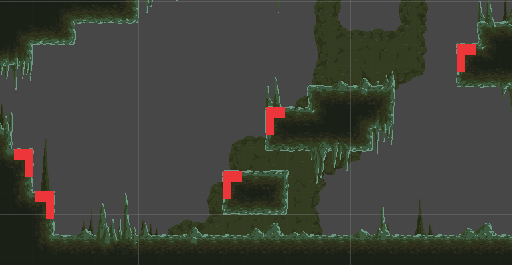 Completed the tileset and room layout for a new level. Doors are fun to break, so I put a bunch of them in the castle. But those leftover, empty hinges look a little odd. They might need some splintered wood, or something. 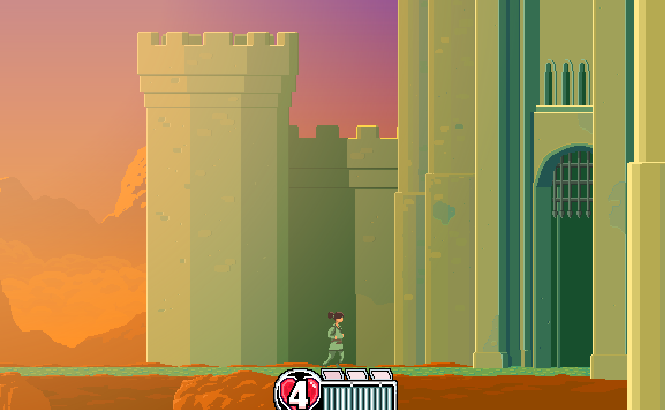 This is the first level that I gave a dropshadow to the background wall. It kind of gives the castle a (vague) dollhouse look. The next step is to fill it with monsters. I'm planning on tubby knights, axe goblins, and magical constructs that climb out of the walls. ...That back leg is kind of rigid. This is a lot more lewd than I intended. Here's a turn animation without any flip frames. That sorta works, I guess. But two extra frames really help sell it. I've begun avoiding dead-center keyframes. Most of the time, I feel like it looks better without them. Can't wait to do the SFX for this guy. Really impressive attention to detail, thanks for sharing some of your thought process. Also: am I supposed to think of vomit when I read "Castle Vomm" because the goblin sure isn't making me not think that. Also: am I supposed to think of vomit when I read "Castle Vomm" because the goblin sure isn't making me not think that. Just a dumb syllable with an extra M in the trunk. Ironically, this is the one level where there aren't any enemies who spit at you. Hold on. I got another guy who vomits. Technically, you need a bell in your tower to have a belfry. And I've never seen a dull red blueberry, before. But after you write a dumb filename at 3AM, why change it? but this guy is built for tower chests only. He just sits right on top of them. Check out the layer setup. I'm growing fonder of badguys with big faces. I kept an archive of the WIPs. The objective is an 8-frame run animation. so I did that first. Right here, I already messed up. Have you ever just turned on a podcast and zoned out? That's what happened here, because I just kept going. Those are proper bird legs. I gave people legs to a bird. but, technically, the animation works. They just look super weird. that I had time to grow attached to it. It kinda looks like a guy in tights wearing a bird suit. AWESOME an amazing pixel art and the moviments are very fluid! Incredible! Most of the enemy death animations are non-directional. The giblets have no preferred momentum. Single-color sprites are soooo easy to animate. for when the enemy gets struck in the back, the animation has limited purpose. spawn and attack in a very reliable direction. 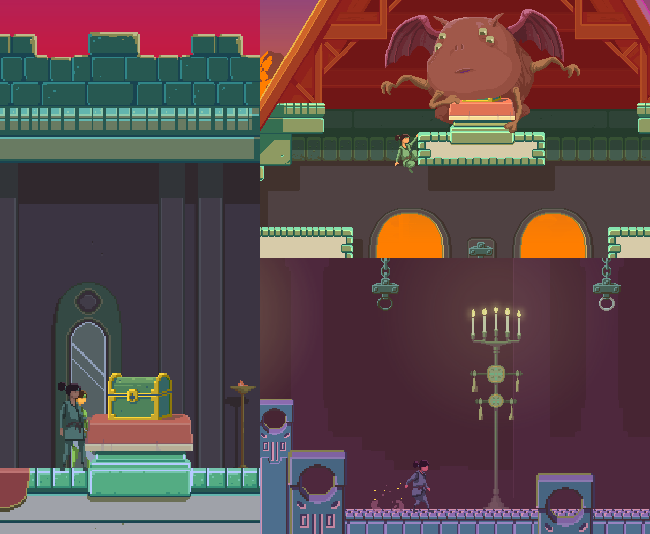 I'm wrapping up asset creation for Castle Vomm. Still a ton left to do, but at least the art's finished. 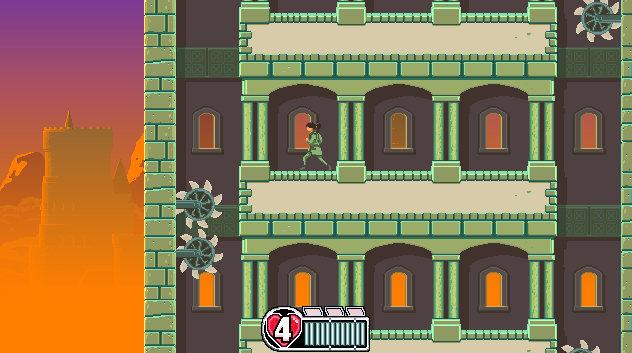 Here's the boss with his descending, floating, and rising animations. Like any self-respecting castle boss, he's got a crown. Like any self-respecting squirrel, he flies with his ears. I'm not yet sure whether the tail should count as something the player can attack. No damage-on-touch, though. That'd be annoying. Up next is The Capital, which will be the biggest level in the game. I'm very excited to get started! After 1.5 seconds of jogging, Lynn breaks into a run. Any action, from jumping to attacking, instantly cancels the run. honest, I just wanted an excuse to make a run animation. Here's the pizza animation. In reverse. 5-year-old health bar versus yesterday's results. I'm terrible at UI, but permutation breeds results. Eventually. Between you and me, I really shouldn't be doing this. the levels are asset complete. I have to shuffle back down into the sprite mines.